As a Director or Marketing Manager of a small/medium sized business, you need to communicate with your existing and future customers. Text and images still form a significant part of the tool kit you will use. My new e-book, "How small businesses can use text, images and design to promote their companies" will give you a practical overview of the key resources you can use. There will inevitably be omissions so your comments and input will also be valued. The book is based on my practical experience as a company director, providing copy and design for clients and my own company. I have also gained valuable insights and different perspectives through Networking and collaborating with others. Our communication needs are summarised by the graphic below. There are four levels at which we can interact with our customers and peers. Level 1 is the core of our businesses - our direct and immediate interaction with the existing and future clients. The tools here start with our business card and website - the first most likely reference points people will find and check us out by. We maintain a recognisable brand or image via our correspondence, logo and product design. Level 2 represents direct advertising through the media, leaflets, brochures, posters, viral marketing and exhibitions. Often this is done for new products or offers. Level 3 is where we support the image of our company as a trusted expert, through articles, news, information and even books. Rather than bluntly advertising, the display and sharing of our knowledge creates a desire to want to work with us. 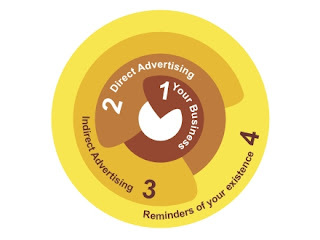 Level 4 are the smaller reminders of our companies existence; e.g. the company calendar, promotional pen or memory stick. Future articles will expand both on the levels, the means and the toolkit!